The first question anyone who knows racing should ask here is why run a Ghia? To win, you can’t just run a car you love and hope it will win. You have to run a car you know that can win. The VW Karmann Ghia is that car. Here’s the bullet points of why it can win. The Ghia is light, 2000lb. and under. In today’s racing world that is usually 1000lb. less than the competition. And by competition, we mean anything you pick out on the track to beat. Forget classes for a moment, think lap times. The Ghia has the advantage of a rear engine, which greatly helps accelleration traction, and weight distribution in braking over almost any front engine car. 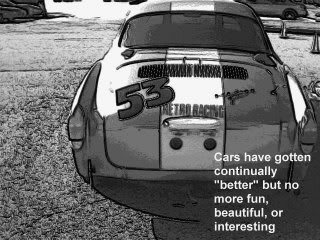 Old Doc Porsche knew what he was doing with the suspension design, and general chassis dynamics. It was the layout of his Grand Prix Auto Unions just before WWII. The Ghia’s chassis comes from an old race car, but one that works.